Knowing some of the major differences between the two contracts can help guide you towards which contract serves you best for the situation. My concern has always been that the "as-is" contract is overused and doesn't always serve the buying public in a way they expect. There is a way to get the best of both contracts that may not be in the best interest of the brokers involved in the contract. 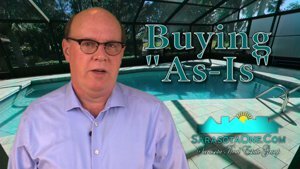 The reason I understand the “as-is” is viewed with so much favor is because it gives you, the buyer, an unconditional out for just about any reason during inspection period. This can be a good thing but remember, you are going to spend both time and money having an inspection and there are no requirements for the seller to fix anything. In practice, the general approach is that once an inspection is done, then there is a second negotiation for repairs. Now, depending on how the as-is was presented to the seller during the negotiation, you may or may not be able to get repairs or concessions from the seller. If the seller refuses to negotiate the repair request, you are out the inspection fee as the seller is not obligated to do anything. I think there is second reason why brokerages like as-is contracts that I’ll circle back to in a bit. You might be surprised, their reason has nothing to do with protecting your interests! writing the offer and looked over the seller’s property disclosure. You should have a fairly good handle on the overall condition of the home and what to expect out of a home inspection. The standard contract, however, does have the requirement you perform home inspection with a real home inspector and not your Uncle Joe. With money put into the repair kitty up front, there aren’t necessarily any negotiations. The seller is obligated to fix those items as long as the cost is within the repair limit. The seller DOES have the option to exceed the repair limit which may sound good but there are those cases where something is found that concerns you to the point where you really would rather move on to another home...fixed or not. Here is where things can get a little tricky. Say, for instance, the AC is not functioning properly and needs to be replaced. Using the standard contract, the seller has the option to repair it and you are still locked into the contract because the seller has the option to make repairs that exceed the repair limit. You don’t have any say. In this case, no issue…who wouldn’t want a new AC? The standard contract has a default amount of 1.5% of the contract sales price in each (general inspection, wood destroying organisms, and closing of permits) inspection category. Rarely, if ever, will a seller agree to these amounts which total 4.5% of the contract. The best course of action is to go in with a reasonable amount for the general inspection and then progressively less in the WDO and permit section. "Reasonable" should be a balance of the overall condition and purchase price. We are generally able to get money negotiated when those amounts are generally reasonable. But suppose there is some overgrown landscaping right up to the house you from seeing a portion of the exterior wall. Inspection finds a half-inch crack from the ground up to the roof line and comments the back wall of the house if getting ready to fall over. Seller decides they will fix it, you don’t want a house with foundation issues for any price but you are stuck in the contract. This is an area of the standard contract that would be a cause for concern. There is a solution. best of both worlds. New AC – Good, Foundation issues – Bad…at any price. Having the standard contract with the option to get out is probably the best position to be in. It takes care of minor issues and also allows you from being forced to take a home that, after the inspection, you don’t want. As I mentioned earlier, if you could get the best of both contracts, why do brokerages and agents push the as-is contract? My guess is the short paragraph found only in the as-in contact, paragraph 18X. Not only are you agreeing any future claims waived against the seller, they are also waived against and real estate licensee and brokerage involved in the contract. What? With so many new agents coming into the real estate biz every month, brokers look to every opportunity to reduce risk and paragraph X does this. What you are additionally giving up recourse due to issues that may be found AFTER the home inspection. Typically, the title search, which can reveal defects not readily found during and inspection such as code violations, and unpermitted work, should be of concern BEFORE the inspection period expires. If there is something that come up, you are responsible to have it taken care of. There is language elsewhere in the contract that would require the seller to cooperate with addressing these issue but it specifically states there is no cost the seller will bear while helping you resolve the issue. You are looking for help from your real estate agent and have developed a level of trust. Hopefully you formally engaged a knowledgeable, experienced agent as your buyer agent up front. You count on them and put your trust in them. Then why would they unwind themselves from anything they represent to you about a property with the “as-is”? What they are really up to? There ARE times the “as-is” is a better choice but (In my opinion) not to the extent it is being used today. Basically they cancel out being responsible to you for anything they say about the property. The impression is that using the "as-is," there is no real agent/broker liability to worry about when they point out all the reasons you should "buy this house." I guess that works to get the deal especially if you are new agent looking for a “first sale.” Ever felt pushed to buy? Not saying that is how everyone works but you have to wonder. There are always circumstances that differ from property to property as well as the differing dynamics of the personalities involved with any contract negotiation. There is no "best" contract to use in all cases. One thing is guaranteed, there is no "one-size" fits all scenarios. Our objective is to highlight some of the aspects of the two contracts most REALTOR members will use and to explore some of the aspects you might not be aware of. Be sure to check with your REALTOR or attorney if you have questions about the best contract to use as this is not to be taken as legal advice. We are not attorneys. Why a Buyer Agent - It's harder to find one that you think.